The Angel Heart family gathered at UC Irvine for the 11th Annual Meeting on March 4, 2018 to recap the successes from the 2017 year. This year, the annual meeting was held as a roundtable discussion which was a departure from previous years’ formal presentation style. Dr. Shouyan Lee, the founder of Angel Heart International, opened the meeting with the State of the Union address with Angel Heart International (AHI) goals for 2018. Ms. Kelly Chu, the CEO of Pacific Academy, then spoke about Pacific Academy’s previous involvement with AHI, from the Pacific Academy Angel Heart Club to the past successes with fundraising concerts. She also shared her own experience with the 2016 Gansu trip. Following Ms. Kelly, Dr. Hengchu Cao, a longtime AHI volunteer, reminded everyone of the fruitful growth of AHI through his eleven years with the organization. The afternoon’s hosts, high school volunteers Jenny Wang and Kimberly Shi from Trabuco Hills and Northwood, respectively, presented some of the highlights from this past year. A few of the patient stories highlighted from this past year include Pang Yuxuan, Gui Sihan, and Ma Ziqi. Please refer to the 2017 Annual Report for some more patient stories. As University High School volunteers Malia Duong and Ariana Caguioa put it, “the annual meeting was inspiring to see the pictures of the children who recently received the surgeries this last year and to see all the accomplishments Angel Heart as achieved.” Additionally, the 2018 Gansu trip application and Dingxi celebration was officially announced. The Dingxi celebration will be the official 10 year anniversary celebration of the first surgery ever conducted by Angel Heart in Gansu. Anyone who has participated in a previous Gansu trip is invited to attend. Please view the previous Facebook post for more information about the 2018 Gansu trip application. 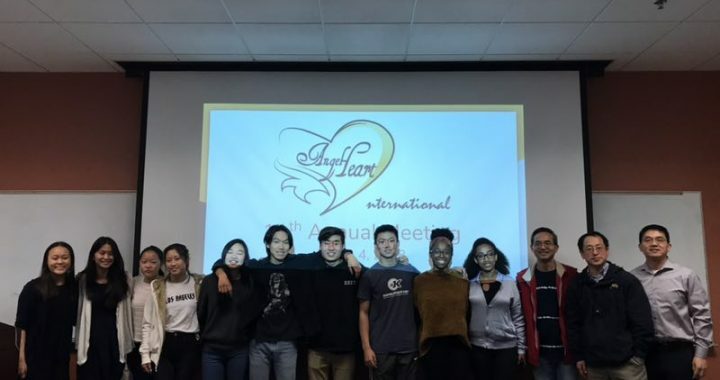 At the conclusion of the meeting, the discussion was opened to a more intimate group of around 25 AHI volunteers as an overflow of ideas about how to overcome current and potential future obstacles. At the roundtable discussion, another high school volunteer Kellie Cao stated that “we discussed strategies to improve communication and therefore the organization and high school clubs.” With goals gleaned from the discussion, Angel Heart International continues to strive to improve the organization and to ultimately change the future of the children we help.